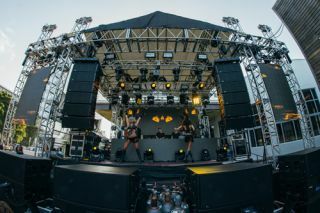 Chicago’s Audio Integration Services (AIS) released its Meyer Sound LYON linear sound reinforcement system at Miami Music Week, serving DJs such as Luciano and Alesso at the Hyde Beach stage. The LYON sound system on the Hyde Beach stage at Miami Music Week. LYON’s power-to-size ratio was demonstrated at the Hyde Beach stage. Energizing the 1,300 person crowd was a system that only included six LYON linear line array loudspeakers per side and 12 1100-LFC low-frequency control elements. A Galileo Callisto loudspeaker management system with two Galileo Callisto array processors provided system drive and alignment. The sound system is part of AIS’s strategy to grow its foothold in EDM and to diversify its business into other event markets. After searching for two years, AIS selected LYON when Owens heard it at Chicago’s EDM-heavy North Coast Music Festival.